CPC Theatrical’s much anticipated new production of William Shakespeare’s Hamlet, Prince of Denmark opened at the Abbey Theater on Thursday, June 25, 2015. Scheduled for a limited, one weekend run, the show closed on Saturday evening, June 27. Hamlet was directed by Jai Furlong. The classic tragedy featured Jack Miller as Hamlet; J.T. McDaniel as King Claudius and the Ghost; Grace Rinehart as Queen Gertrude; Justin Eberhard as the royal chamberlain Polonius; Kyle Smith as Horatio; Rachel Marschner as Ophelia; Devon Porter as Laertes and the First Player; John Grote as Marcellus, a Gentleman, and Osric; Eduardo Lozano as Bernardo, a Priest, and a Lord; and Ashton Brammer as the Player Queen, the Gravedigger, and a Messenger. The two hour and twenty minute abridgement was created by J.T. McDaniel. Peripheral characters, such as the ambassadors Voltimand and Cornelius, Polonius’ servant Reynaldo, the pirate messengers, and the whole Fortinbras plotline were cut. So were Rosencrantz and Guildenstern, who use up a remarkably large amount of stage time to do very little other than be annoying. As a consequence, the story moves along at a much faster pace than in the unabridged version (which averages a little over four hours without any intermissions). A good bit of repetition was also cut, such as when a character goes on in endless detail about something the audience saw ten minutes earlier (which is why our version started with Scene 2, a particularly common cut going back well over a century). The script of our abridged version will be available for purchase shortly, for any companies that want to do the same version. As this is Shakespeare, no royalties will apply, though CPC Theatrical naturally hopes any producers will buy scripts for the whole cast. 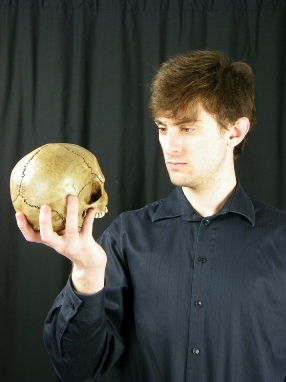 Jack Miller appeared as Hamlet in CPC Theatrical’s new production, June 25-27, at the Abbey Theater of Dublin. The cast of Hamlet graced the Franklinton Theatre Stage at the Columbus Arts Festival Friday evening and Saturday afternoon (June 12/13), playing before appreciative audiences despite threatening (and at one point actually raining) skies. For more information on the Columbus Arts Festival, take a look at their website. For a selection of clips from the Arts Festival, see our Media page.